Is all immoral action a violation of a duty to someone? It is possible to act wrongly without wronging any person. It is possible to wrong oneself. There is a necessarily existing person. I think (2) and (3) are true. I deny (1), because I think that every wrongdoing wrongs oneself and God. I shall argue that at least one of (1)-(3) is true. I think the disjunction of (1)-(3) is also controversial, so this result has some interest, I suppose. If there are no necessarily existing persons, then it is possible that there is only one person in existence and she acts wrongly. It is not possible to wrong a non-existent person. Given (4) and (5), the argument is easy. For a reductio, assume that none of (1), (2) and (3) are true. Since (3) is false, it follows from (4) that there is a world w at which is there is only one person in existence and she acts wrongly. By (5) she does not wrong anyone except perhaps herself. But by (1) and (2), she wrongs someone other than herself in w.
I think (5) is very plausible, but (4) needs argument. The argument depends on a simple case. If there are no necessarily existing persons, it is possible that there be only one person in existence and that she be imperfect. (One might think that necessarily if there are imperfect persons, there is a perfect person, but that is only plausible if necessarily there is a perfect person.) Suppose Sally is the one person in existence and she knows that torture of the innocent is wrong and justifiably but falsely believes that by pressing a button she would be torturing an innocent other. She presses the button in order to torture that innocent other for fun. In so doing, she acts against her conscious and clearly does wrong. Suppose one bites the bullet and says that Sally doesn't do anything wrong. Then by the same token, if I shoot at a distant shape falsely believing it to be the present king of France, but in fact it's just a rosebush, I do not wrong. And that's absurd. Perhaps, though, (5) can be denied, and it can be insisted that a merely possible person is wronged by Sally. But, still, which possible person is wronged in the Sally scenario? The only at all plausible answer I can think of is: every possible person who could possibly satisfy the description under which Sally intends to torture is wronged. But suppose that Sally also justifiably but falsely believes that humans are reptiles, and she intends to torture an innocent human reptile. Then there is no possible person who fits her description. And the idea that one can wrong impossible persons seems really weird. Certainly it seems more problematic than the disjunction of (1)-(3). Or maybe instead of wronging possible persons, one can wrong fictional persons. But then writers are in grave moral danger! It seems, for instance, much preferable to suppose one can wrong oneself than to suppose that one can wrong a fictional person. Here's a a nice article (thanks, David, for the heads-up). Is the claim that truth is completely characterized by the deflationary theory itself a part of the deflationary theory of truth? The theory which includes (1) and statements X-Z completely characterizes truth. Suppose now that the claim that truth is completely characterized by the deflationary theory of truth is not a part of the deflationary theory of truth. There are now two options. Either the completeness claim is or is not known to be a consequence of the deflationary theory of truth. If it is not a known consequence of the deflationary theory of truth, then we have a problem for deflationary theorists who assert that the deflationary theory of truth is complete. For if they do not know their assertion to be a consequence of the deflationary theory of truth. But if it is not a consequence of it, then the theory is not complete. So it seems unlikely that they know the theory to be complete, and they are asserting something something they do not know. Suppose that the completeness claim is known to be a consequence of the deflationary theory of truth. But the deflationary theory of truth without the completeness claim consists merely in a claim as to what the truth-bearers are and all the instances of the T-schema. But the completeness claim simply does not follow from these. For there are multiple predicates, with "is true" being only one of them, that satisfy the deflationary theory of truth: any predicate extensionally equivalent to "is true" satisfies the deflationary theory of truth just as well. And such predicates are myriad. For instance: "is true and is not false", "is believed by God", "is true if 2+2=4", etc. Perhaps if we add to the deflationary theory that "is true" expresses a very natural property, then we can rule out some of the alternate predicates. But "is believed by God" appears very natural as well. So at least the theist can't take this way out. We should distinguish between two kinds of choices. Intrinsically free choices are free solely in virtue of the internal features of how the choice is made (if externalism about the mind is true, we may need to allow mental facts to count as "internal" for the purposes of distinguishing between chocies). Any exact duplicate of an intrinsically free choice will also be free. Extrinsically free choices are free in part in virtue of something occurring or not occurring outside the choice itself, typically facts about the history of the agent. Paradigm libertarian-free choices are intrinsically free. If Curley is choosing whether to take a bribe or not, and he is causally and psychologically able to take it and causally and psychologically able not to take it, and he has non-overwhelming motivations in favor of taking the bribe (he desires money) and non-overwhelming motivations in favor of not taking the bribe (he desires to avoid moral degradation and he desires to avoid jail), then it does not matter whether he was brainwashed into having a desire for money and a desire to avoid moral degradation. His choice is intrinsically free. Note that, interestingly, Frankfurt examples trade on our intuition that at least some of our choices are intrinsically free—that's why the neurosurgeon's standing by does not affect the choice's freedom. Libertarians can, of course, admit that there are extrinsically free choices. Thus, if my earlier free decisions have formed, through the right kinds of causal chains, a character that is unable to give my son a scorpion when he asks for bread, I may still act freely when I refrain from giving my son a scorpion when he asks for bread. However, this is an extrinsic freedom. For if I were brainwashed into having this sort of character, I would not be acting freely. Compatibilists are committed, I think, to the claim that it is possible for all of one's free choices to be merely extrinsically free. We can then argue for incompatibilism by arguing that the freedom of an extrinsically free choice always depends on one's being antecedently (to the choice) responsible for something outside the choice itself, and that anything one is responsible for depends on a free (intrinsically or extrinsically so) choice or on something else one is responsible for. For then, if all choices are extrinsically free, an infinite regress will be generated. One might make a similar distinction about responsibility, and then try to argue that intrinsically free choices are the only thing one can be intrinsically responsible for. If one could do that, and then argue that anything one is extrinsically responsible for one is responsible for in part because one is responsible for something else, again a regress results if there is nothing that we are intrinsically responsible for. A temporally pure property of an object is an object whose possession by the object at a time is only a matter of how the object is at that time. I don't know if there are any temporally pure monadic properties. Two kinds of candidates seems initially plausible: conscious mental properties like being in pain and geometrical properties like being round. But neither kind of candidate seems to stand up to scrutiny. The shorter the amount of time a pain lasts, for a fixed intensity, the proportionately less one notices it. Therefore, if a pain were to last just for instant, one would not notice it at all—it would have zero temporal length. If this is right, then having a pain, and by extension having any other conscious state, cannot just be a matter of what happens at a particular time—it must be a matter of what happens at neighboring times. There is a supporting argument for this on naturalism: surely what mental states we have depends not just on the static properties of our parts, but also on dynamic ones, like the velocities of parts; but velocities are not a matter of what happens at any one time. Geometrical properties, on the other hand, are surely relational. Being round seems to be a matter of the relations in which one stands to points in spacetime (on absolutist views of spacetime) or to other objects (on relational views). Moreover, three-dimensional shape is clearly relative to the reference frame. If (a) were I to do A, p would be the case but were I not to do A, p would not be the case, and (b) I can rationally deliberate over whether to do A, then I could rationally deliberate over whether to act so that p would hold. For no proposition p about the past could I rationally deliberate over whether to act so that p would hold. If determinism is true, then for any action A I can rationally deliberate over, there is some proposition p about the past such that were I to do A, p would be the case and were I not to do A, p would not be the case. There is an action that I can rationally deliberate over which I will not actually do. If determinism is true, I couldn't rationally deliberate over a proposition solely about laws of nature. If determinism is true, then for any action A I can rationally deliberate over, there is some proposition p solely about the laws of nature such that were I to do A, p would be the case and were I not to do A, p would not be the case. One problem with the above argument is that one can deliberate about the past or about the laws of nature when one does not know that one is so doing (for instance, one might speculate whether to make it be the case that E happens at t without knowing that t is in fact in the past). I suppose it is a stipulation about how I use "rational" that I won't count that as rational. Perhaps a different word than "rationally" should be used, like "properly": I cannot properly deliberate over the past. If determinism is true, then any possible world in which at t0 I act differently from how I actually act at t0 is a world where either (a) the laws are different from the actual world's laws or (b) the laws are the same but the past is different at every time prior to t0. In case (b), it follows that my own causal history will be different in that world. But if essentiality of origins is true, my own causal history could not have been different. Therefore, if essentiality of origins and determinism are both true, then any possible world in which at t0 I act differently from how I actually act at t0 is a world where the laws are different from how they are. On the plausible assumption that I cannot do something the doing of which entails that the laws are other than they are at @ (where "@" names the actual world), it follows that if determinism and essentiality of origins are true, then I cannot act otherwise than I do. Or, to put it differently, if essentiality of origins holds, the compatibilist's "Had I wanted to, I would have acted differently" conditionals are counter-nomic. But it is most implausible that a counter-nomic conditional would suffice to capture our "could have done otherwise" conditionals. Therefore, if essentiality of origins is true, either determinism is false or we are not free. You can't be wrong if you have no opinions. I will develop Dembski's specified complexity in a particular direction, which may or may not be exactly his, but which I think can be defended to a point. Specified Complexity (SC) comes from the fact that there are three somewhat natural probability measures on physical arrangements. For definiteness, think of physical arrangements as black-and-white pixel patterns on a screen, and then there are 2n arrangements where n is the number of pixels. There are three different fairly natural probability measures on this. 1. There is what one might call "a rearrangement (or Humean) measure" which assigns every arrangement equal probability. In the pixel case, that is 2-n.
2. There is "a nomic measure". Basically, the probability of an arrangement is the probability that, given the laws (and initial conditions? we're going to have two ways of doing it--one allowing the initial conditions to vary, and one to vary), such an arrangement would arise. 3. There is what one might call "a description measure". This is relative to a language L that can describe pixel arrangements. One way to generate a description measure is to begin by generating random finite-length strings of symbols from L supplemented with an "end of sentence" marker which, when generated, ends a string. Thus, the probability of a string of length k is m-k where m is the number of symbols in L (including the end of sentence marker). Take this probability measure and condition on (a) the string being grammatical and (b) describing a unique arrangement. The resulting conditional probability measure on the sentences of L that describe a unique arrangement then gives rise to a probability measure on the arrangements themselves: the description probability of an arrangement A is the (conditionalized as before) probability that a sentence of L describes A. So, basically we have the less anthropocentric nomic and rearrangement measures, and the more anthropocentric description measure. The rearrangement measure has no biases. The nomic measure has a bias in favor of what the laws can produce. The description measure has a bias in favor of what can be more briefly described. For instance, consider the arrangement where all the pixels are black. In a language L based on First Order Logic, there are some very short descriptions of this: "(x)(Bx)". So, the description measure of the all-black arrangement will be much bigger than the description measure of something messy that needs a description like "Bx1&Bx2&Wx3&...&Bxn". On the other hand, the rearrangement measure of the all-black arrangement is the same as that of any other arrangement. In this case, then, the L-description measure of the all-black arrangement will be much greater than its rearrangement measure, and so we will have specified rearrangement complexity, relative to L. Whether we will have nomic rearrangement complexity depends on the physics involved in the arrangement. All of the above seems pretty rigorous, or capable of being made so. Now, given the above, we have the philosophical question: Does SC give one reason to suppose agency? Here is where things get more hairy and less rigorous. An initial problem: The concept of SC is language-relative. For any arrangement A, there is a language L1 relative to which A lacks complexity and a language L2 relative to which A has complexity. So SC had better be defined in terms of a privileged kind of language. I think this is a serious problem for the whole approach, but I do not know that it is insuperable. For instance, easily inter-translatable languages are probably going to give rise to similar orders of magnitude within the description measures. We might require that the language L be the language of a completed and well-developed physics. Or we might stipulate L to be some extension of FOL with the predicates corresponding to the perfectly normal properties. There are tough technical problems here, and I wish Dembski would do more here. Call any language that works well here "canonical". Once we have this taken care of, it it can be done, we can ask: Is there any reason to think that SC is a mark of design? Here, I think Dembski's intuition is something like this: Suppose I know nothing of an agent's ends. What can I say about the agent's intentions? Well, an agent's space of thoughts is going to be approximately similar to a canonical language (maybe in some cases it will constitute a canonical language). Without any information on the agent's ends, it is reasonable to estimate the probabilities of an agent having a particular intention in terms of the description measure relative to a canonical language. But if this is right, then the approach has some hope of working, doesn't it? For suppose you have nomic specified complexity of an arrangement A relative to a canonical language. Then P(A|no agency) will be much smaller than the description measure of L, which is an approximation to P(A|agency) with no information about the sort of agency going on. Therefore, A incrementally confirms the agency hypothesis. The rest is a question of priors (which Dembski skirts by using absolute probability bounds). The problem of canonical languages. The problem that in the end we want this to apply even to supernatural designers who probably do not think linguistically. Why think that briefer descriptions are more likely to match their intentions? We do have some information on the ends of agents in general--agents pursue what they take to be valuable. And the description measure does not take value into account. Still, insofar as there is value in simplicity, and the description measure favors briefer descriptions, the description measure captures something of value. We can see shadows, even though surely shadows don't exist—there is nothing to them, but lack. Dark nebulae can also be seen, as the photo shows. However, a dark nebula isn't a complete nonentity like a shadow. It is a molecular cloud of particles that obscure the stars behind it. Those who believe in unrestricted compositionality will even think that they are really existing objects. 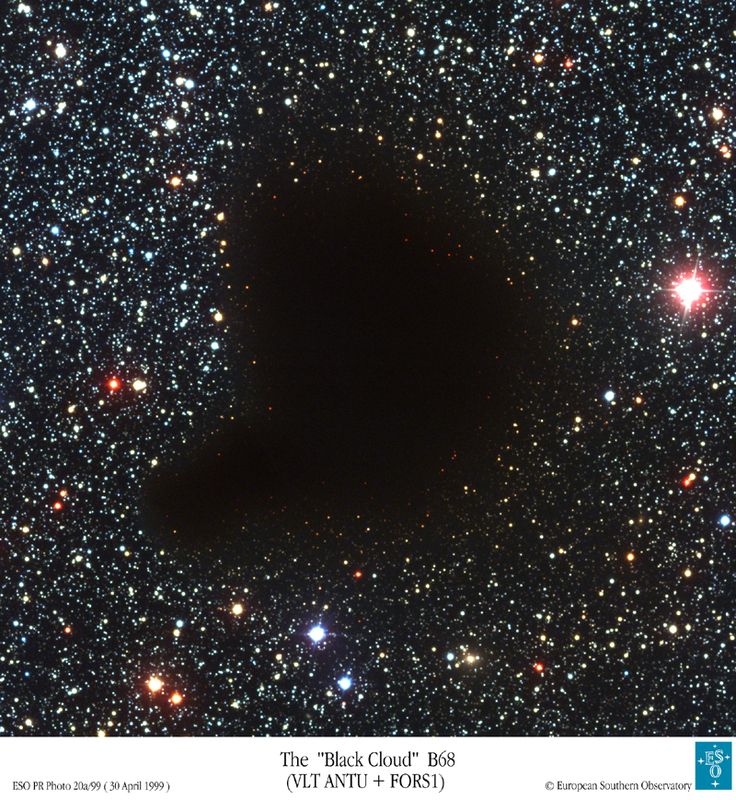 But seeing a dark nebula is rather different from seeing a shadow. The shadow's shadowy being is constituted by the absence of light. The absence of light in the case of the dark nebula does nothing to constitute the nebula—it is simply that the dark nebula has absorbed the light from the stars and other objects behind it. Here is an argument that we see dark nebulae. Two nights ago, I tried to see Barnard 91. I thought I saw it, but I was looking at the wrong thing. So, I tried to see it, and failed. But this suggests that there is a distinction between seeing and not seeing it. There may seem to be something paradoxical here. Isn't seeing supposed to be a causal process, where patterns of light are seen and caused by the object seen? But in the case of the dark nebula—or a human silhouette in the dark, outlined against a light—it is precisely a matter of the absence of light caused by the object seen. However, patterns can be constituted by absence as well as presence. When I look at a sheet of transparent red plastic, the redness of the plastic comes from the plastic's selective transmission characteristics: it lets red light through, and holds back much of the rest of the visible spectrum. The case of the dark nebula and silhouette are just limiting cases of this. But what the above helps show is that the "in the right way" causal condition for seeing is going to be very complicated. Does this matter? Maybe: it does make life harder for reductionist accounts of perception. In a very large (e.g., infinite) undesigned multiverse, there is nothing incongruous. There is something genuinely intrinsically funny in our universe. The genuinely intrinsically funny is incongruous. Therefore, our universe is not a part of a very large undesigned multiverse. The point behind (1) is that when you have all these probabilistic resources, you don't have incongruity, no matter how weird the stuff in it is. (Premise) The platypus is genuinely funny. (Premise) The genuinely funny is incongruous. (Premise) The platypus is either a result of evolution or design (by a designer) or both. (Premise) If the platypus is a result of evolution without design (by a designer), it is not incongruous. Therefore, the platypus is a result of design (by a designer). Therefore, there is a designer (by a designer). The most controversial premise is (4). But look—if evolution is running the platypus show, without a designer, behind everything there is randomness. But there is nothing incongruous in weird stuff that arose from randomness. It is tempting to conclude from (6) that the designer has a sense of humor. But that takes extra steps. For there are two ways that a designer can produce something funny: by comic skill and by comic failure. So we would need a way of eliminating the latter possibility. I think to do that one would need a plausibility argument: the platypus requires great intelligence, and does not appear to be a failure. Light-hearted as the above argument is, it points to an important feature of the debate between the naturalist and the theist. The theist can take as independent objective explananda features of the world that the naturalist has to eliminate away, reduce to the agent's subjectivity (e.g., the platypus being funny just means we find it funny; M 42 being beautiful just means we find it beautiful) or explain by means of a coincidence (e.g., such-and-such features were a selective advantage, and as it happens, it is a necessary truth that such-and-such features are funny or beautiful or whatever). The theist can take many of these humanly significant features of the world at face value, and then explain them as taken at face value. (Premise) Many people know that God exists. (Premise) If p is known, then p is true. The argument is valid, and according to many strands of traditional theism, it is sound. But the argument sounds question-begging. The atheist will surely deny that (1) is true, unless "know" is used in the humorous sense of "She knows many thigs that aren't true". would seem to be equally question-begging. What the relevant scientists all claim to know is likely true. What many people claim to know is likely true. I actually think (8) is true. Of course, the "likely" here needs to be taken to mean "likely absent other evidence", just as in (7) (if one knows that all the biologists are in the pay of an organization that for tax purposes seeks to have platypus fur classified as mammalian fur, then that weakens the weight of the claim to knowledge). However, (8) is a pretty controversial principle of credulity. And I don't actually know that the argument from (4) to (5) uses a non-standard reading of "know". Could there be a person who is rational in accepting (3) on the grounds of (1)? I think so. A person might rationally believe that there are persons of such an intellectual carefulness and honesty that when they claim to know, it is very likely that they do in fact know. One might then come to believe that there are many theists who claim to know theism to be true and who fall in this category. Thus, likely, (1) is true. And hence so is (3). It's hard to come up with a sound argument that couldn't be rationally helpful, unless the conclusion is literally one of the premises. A state S of x represents that p iff x ought not be in S if not-p. The "ought not be in S if not-p" should be read as a conditional norm. In particular, it should not be simply analyzed as "not-p → ought(not-S)" where the → is a conditional. Some illustrations. One ought not say "Snow is white" if it's not the case that snow is white. So saying "Snow is white" represents that snow is white. One ought not kill a person without appropriate authority. Therefore, killing a person represents having that authority. One ought not have an apparent perception of an elephant if it's not the case that an elephant is present. Hence, an apparent perception of an elephant represents that an elephant is present. A joey ought not venture far from the pouch if it is not mature enough. Hence, the joey's venturing far from the pouch represents that it is mature enough. The joey example shows that representation is a wide phenomenon, and need not involve a mind (the joey has a mind of some sort, but the representation in question need not be mental). The speech example shows that the theory requires the truth account of the norm of assertion. Objection 1: If that p entails that q, and x ought not to be in S if not-p, then x ought not to be in S if not-q. But then if a state represents a proposition, it represents everything which that proposition entails. And that is implausible. Response: It does not seem to me that the conclusion is really so very bad. Bradwardine's account of assertion has a similar consequence, and that seems to be a strength of it. But I do not know that the conclusion follows. It depends on the logic of obligations. Suppose the entailment thesis is true and imagine that I validly promise not to scratch my head unless it's an odd numbered day of the month. Suppose that I scratch my head on the 8th of the month. Do I then violate an infinite number of obligations: the duty not to scratch if the day is even, the duty not to scratch if the day is divisible by four, the duty not to scratch if the day is even and less than 9, the duty not to scratch if the day is even and less than 10, and so on? This seems to be multiplying immorality without good reason. It seems better to say: I now have a duty not to scratch my head if it's not an odd numbered day, and if I scratch my head on a day that's divisible by four, then necessary I violate that duty. Objection 2: It is very plausible that on this view every living thing represents something. Response: What's wrong with that? We have simply reprised a part of Leibniz's system. Objection 3: Often norms conflict. When they do, the same state can end up representing contradictory states of affairs. That seems counterintuitive. Response: We should take the "ought" in (1) as an all-things-considered ought for x. We could deny that the prudential and moral oughts are potentially conflicting all-things-considered oughts. (Either by denying that they are potentially conflicting or denying of at least one of them that it is all-things-considred.) If we can't do that, then we do in fact get the consequence that sometimes the same state can represent contradictory states of affairs. But why is that so bad? After all, if I am speaking to two people, each of whom speaks a different dialect of English, I might duplicitously utter a sentence which to one speaker will represent p and to the other a conflicting q. In such a case, my one speaking does represent two things that conflict. Objection 4: It is sometimes all-things-considered right to speak falsely. Response: Lying is always all-things-considered wrong. It is a betrayal of trust which does not treat the interlocutor as an end in herself. And it may be that the right way to understand the moral duty correlate to the wrong of lying is as the duty to speak only the truth. Final remark: Even though these objections can be overcome, I have a strong intuition that representation involves a mind, which (1) does not do justice to. For that reason, I reject the view. The Christian tradition is clear on Christian faith being certain, a certainty due to the Holy Spirit, either in revealing the doctrines of faith or in enlightening the believer's mind or both. But as an empirical fact, Christians, even ones with a genuine living faith, do struggle in faith, and at times their belief appears quite uncertain. If the certainty of faith is defined by a feeling of certainty, the Christians don't have certainty. But that is surely the wrong way to think about. After all, the Christian who has living faith has faith even while asleep (otherwise, no one who died in sleep could be saved!). I suppose that was a cheap shot, since one could define certainty in terms of a disposition to feel certain in appropriate circumstances, but the whole idea of taking a feeling to be central to faith misses the phenomenon of the dark night of faith. I want to suggest that certainty is tied to ungiveupability. In other words, a belief is the less certain, the more willing we would be to give it up. One of going from this is to spell this out in terms of commitment. My belief that p is certain to the extent that I am committed to believing p. Now, when I am committed to doing something, I am typically committed to doing it except in exceptional circumstances. And the degree of commmitment can be measured by the amount of exceptional circumstances and their probability—the more exceptions there are and the more likely the exceptions to befall me, the less committed I am. Maximal commitment to A, then, would be commitment to A in all possible circumstances in which one could find oneself. However, commitment is primarily a normative matter. One can be normatively committed to doing something even if one has no psychological attitude in favor of it. I can be normatively committed to never eating meat while (intentionally) munching on a steak—all it would take would be for me to have just promised never to eat meat. We call this "infidelity to one's commitments", and it is essential to this that the commitment still be binding on one. If commitment is a normative matter of this sort, then the fact that Christians may feel uncertain is beside the point. What matter is that they are committed, i.e., that they are under an obligation (maybe we need to add: that they themselves undertook), not that they feel committed. In other words, the Christian's certainty consists in its being the case that she is obliged to believe, no matter what. But that can't be the whole story about certainty. The reason is that this story is compatible with unbelief. After all, if one can be unfaithful to one's commitments, and if the certainty of belief were just commitment to believe, then one could have the certainty of belief without belief. And that's absurd. We could add that to have the certainty of belief you need to believe, but the link between the belief and the certainty surely needs to be tighter. Nor will it help to add that the commitment has to be subjectively acknowledged (this subjective acknowledgment of a commitment is sometimes itself called "commitment"). For I can acknowledge an obligation not to eat meat while munching on a steak. Here is another suggestion. Instead of reading the certainty normatively, read it causally. Here is one take on it. A person x is certain in believing p to the degree that it would be difficult to make her cease to believe p. If, given the present state of the world, it is altogether causally impossible for x to cease to believe p, then we can say that x has absolutely unshakeable certainty that p. Maybe some who believe in the doctrine Reformed folks call "the perseverance of the saints" believe that the elect have this sort of certainty. But this merely causal unshakeability may not be suited to an analysis of certainty, which in the context of the Christian faith seems to have an epistemic component: not only is it that the Christian's faith can't (in some sense to be explained shortly) be shaken, but it is appropriate, epistemically and morally, that it not be shaken. Moreover, I do not think we should commit to "the perseverance of the saints" as understood by the Reformed—there are too many warnings in Scripture about the danger of falling away (though I know the Reformed have their own readings of those). Therefore, we should allow for the possibility that x might freely choose to be irrational and stop believing. x has appropriately unshakeable certainty that p if and only if x believes that p and it is causally necessary that x continue to epistemically obligatorily (or, for what would in practice tend to be a weaker definition: appropriately) believe that p so long as x refrains from gravely immoral actions. Why "gravely"? Because the certainty would be too fragile if it could be lost by any immoral action. Notice what appropriate unshakeability does not require. First, it does not require that there be a Bayesian credence of one in p. Nor does it require that there be no metaphysically evidence E such that P(p|E) is small. All that's required is that it be causally necessary either that x not observe E or that should x observe E, something should turn up (by the grace of God, immediate or mediate) that would continue to render it epistemically obligatory (or at least permissible) to believe it. The above story is compatible with multiple explanations for the necessity claim. For instance, maybe, the Holy Spirit enlightens the mind in such a way as to internally provide evidence stronger than any that is possible. Or maybe God is committed to ensuring that one will not meet with any strong counter-evidence. Or maybe one has credence 1 and God will help one remain Bayesian-rational and not change that 1. Whence the causal necessity? I suppose it would be grounded in the promises of God—it is causally impossible that the promises of God not be fulfilled. Or maybe oeconomic necessity would be better here than causal necessity—however, I think oeconomic necessity is a special case of nomic necessity. I am grateful to Trent Dougherty for a lot of discussions of certainty, out of which this post flows. Collimating a Newtonian telescope basically means aligning the optical axis of the primary mirror with the optical axis of the eyepiece. An easy way to do this is to use a collimator, e.g., a laser collimator. The collimator is basically a tube that contains a laser that you put in place of the eyepiece. You adjust the angle of the secondary mirror in the telescope so the beam hits the center of the primary mirror, and then you adjust the angle of the primary mirror so that the beam comes back on itself. But it is crucial for this procedure with a laser collimator that the collimator be itself collimated, i.e., that the laser's axis be aligned with the tubing that the laser is in. Now, if we were writing a philosophy paper, at this point it would be very tempting to say: "And a vicious infinite regress ensues." But that would too quick. For a laser-collimator collimator is very simple: a block of wood with two pairs of nails, where each pair makes an approximate vee shape. You then lay the laser collimator on the two vees, aim it at a fairly distant wall, and spin it. Then you adjust the adjustments screws on the laser collimator until the beam doesn't move as you spin the collimator on its axis, at which point the laser is collimated to its housing. Moreover, because of how the geometry works, the vees don't need to be very exactly parallel--all the work is done by spinning. So, it seems, the regress is arrested: the laser-collimator collimator does not itself need collimation. Potential lesson: Perhaps sometimes we philosophers are too quick after one or two steps in a regress to say that the regress is vicious and infinite. For sometimes after two steps, the regress may be stopped with a bit of cleverness. Well, actually, that's not quite right. For the double-vee collimator depends on the laser collimator's housing being a cylinder. And one might argue that manufacturing an exact cylinder requires a procedure like collimation. For suppose that we manufacture the cylinder by taking a block of aluminum, spinning it in a lathe and applying a lathe tool. But to get an exact cylinder, the lathe tool needs to remain, at the end, at an equal distance to the lathe's rotational axis. So that's another alignment procedure that's needed. I don't know how that's done, being foggy on the subject of lathes, but I bet it involves aligning some sort of a guide parallel to the lathe's rotational axis or by moving the workpiece parallel to the rotational axis. So another collimation step will then be needed when manufacturing the lathe. And so the regress does continue. But still only finitely. At some point, parallelism can be achieved, within desired tolerance, by comparing distances, e.g., with calipers. There is still a collimation issue for the calipers, but while previous collimations involved the spatial dimensions, the collimation of calipers uses spatial and temporal dimensions: in other words, the calipers must keep their geometrical properties over time. For instance, if one sets the calipers to one distance, and then compares another, the caliper spacing had better not change over the amount of time it takes the calipers to move from one place to another. So calipers allow one to transfer uniformity over time into uniformity over space. But how do we ensure uniformity over time? By using a rigid material, like hardened steel. And how do we ensure the rigidity of a material? This line of questioning pretty quickly leads to something that we don't ensure: laws of nature, uniform over space and time, that make the existence of fairly rigid materials possible. And if we then ask about the source of these laws and their uniformity, the only plausible answer is God. So, we may add to God's list of attributes: ultimate collimator. There are, of course, other ways of manufacturing cylinders than by using a lathe. One might cast a cylinder in a cylindrical mould--but that just adds an extra step in the regress, since the mould has to be manufactured. Or one might extrude a cylinder by pushing or pulling the material for it through a circular die. In the latter case, one still has to make a circular die, perhaps with a spinning cutter at right angles to a flat piece, and one has to ensure that the material is moved at right angles to the die. So one has changed the problem of parallelism into the very similar problem of aligning at right angles. And I suspect we eventually get back to something like rigid materials anyway. So the lesson that sometimes regresses stop after one or two steps is not aptly illustrated with the case of the collimator. That regress is still, perhaps, finite--but it goes further back, and eventually to God. Many people already know this hint, but I was corresponding with a colleague who didn't, so I thought I'd post it. Analytic philosophy papers often have numbered statements, which are then referred to by number. It would be a big nuisance if after removing one of the numbered statements or inserting another, one had to manually or semi-manually (search and replace for every higher number) update all the relevant statement number references in the text. One way to solve the problem is to use TeX. But TeX is hard to learn, and not so nice for on-screen proofreading. But good old Microsoft Word has a cross-referencing feature. I am using Word 2003, so the newer versions with command ribbons will be slightly different. Instead of typing a reference number into the text by hand when you want to refer to a numbered statement, you just choose Insert | Reference | Cross-reference (alt-I, N, R on my version) from the menu. Make sure that in "Reference type" you have "Numbered item" and under "Insert reference to" you have "Paragraph number". Then you choose the statement from the list, and click on "Insert". Word should eventually update these references if the numbering changes (assuming you've numbered the statements using a numbered style--normally, Word will change hand-numbered statements into a numbered style), maybe at printing tme. If it doesn't, you can select all (ctrl-A), right-click, and choose "Update fields". The UI feels a bit clunky and imperfect (e.g., the next time you choose the reference list, the highlight moves to the top, rather than staying where it was--a big nuisance if one is writing a book and there are tons of numbered statements--but it is usable. Similar methods can be used for referencing chapter and section numbers. One can even cross-reference by page number. Lewis tried to reduce propositions to sets. I think that doesn't work. But maybe the other way around does. Plausibly, for any xs there is a proposition that those xs exist. One can then identify collections with those propositions that affirm the existence of one or more things. Then x is a member of a collection c if and only if c represents, perhaps inter alia, x’s existing. We can then pick out our favorite axioms of set theory, and stipulate that any collection of collections that satisfies these axioms counts as a universe of sets. We will have to make a decision when we defined a collection as a proposition that affirms the existence of one or more things whether nonexistent things are permitted. If they are, and if propositions are all necessary beings, then we will have sets of nonexistent things. If they are not, then we won’t. A significant number of women believe there is a value in giving birth without medical intervention, and in particular without pain medication. Some of them change their minds once they are actually experiencing the pain, but some do not. What is interesting about this kind of a case is that people are accepting pain which they could permissibly avoid. This is a different sort of case from someone who withstands torture to protect her friends from a dictator, since the latter person—immensely admirable as her action is—is doing her moral duty. In the natural childbirth case, the woman accepts excruciating pain for the sake of a morally optional good, apparently of an aretaic sort. If natural childbirth makes possible a very significant but morally optional aretaic good, it is rational to engage in natural childbirth despite severe physical pain. Notice, too, that the aretaic good here is one that presumably is mainly experienced retrospectively. I would expect that while in labor, there is no leisure of mind for the experiencing of the aretaic good. What makes the acceptance of pains reasonable, assuming the antecedent in (1), is the way they fit into a whole story that involves the child's coming into the world and later retrospection. One of the challenges, both intellectual and pastoral, with the problem of evil is our difficulty in imagining how it is that an afterlife can transform the meaning of suffering for an individual. The natural childbirth case provides a helpful analogy. The child's coming into the world and the retrospection, together with the intrinsic aretaic good (assuming for the sake of the argument that there is one—this is easily imaginable), make the suffering make sense. Now, in the childbirth case, the time scale between the suffering and the experience of the good may be shorter, but from the point of view of an infinite afterlife, the difference between twelve hours and seventy years is not so significant. We all will the greatest happiness for ourselves (or so Aristotle, Augustine and Aquinas say). Insofar as we will this happiness to ourselves, we will the necessary means to it--and that may include suffering. So in some sense there is a voluntariness. God knows the structure of our desires better than we do, so he can choose for us more wisely even by our lights than we ourselves do. We are all small children. The greatest wisdom of the wisest humans is as the insight of a smart toddler. Or so we will see it from the viewpoint of eternity, if we are received into the joy of union with God. The kind of right we have to impose suffering on someone for the sake of a good to that person depends a lot on the relationship. For instance, for some children, the total suffering over thirteen years of compulsory schooling (even if not all legally compulsory, the parents may impose all of it) is quite horrendous (I am not talking about myself: I actually had quite a lot of fun at school myself, though I also suffered a lot, but not horrendously so). But parents have the right to impose this suffering for the sake of the good of knowledge. (Of course, if there are alternatives available, such as a different school or homeschooling, that do not involve so much suffering for the child, parents shuld opt for those.) X's parents, thus, are permitted to allow much suffering to X for the sake of X's good. X herself, as the childbirth example shows, is permitted to allow even more suffering to herself. And on this scale, God has the kinds of rights in respect to us that we ourselves have. "The boss says the next time you come in, you are fired." Whom did the caller's "you" refer to? If the extension-determining rule for "you" is "the speaker's interlocutor", then it referred to my wife. In that case, (2) was a false statement, and probably so was (1). A more charitable reading would be that here we have an "attributive use" not of a definite description but of an indexical, and hence "you" refers to the person who is to be fired. This would have the paradoxical hypothetical consequence that had the caller added at the end of the conversation: "You didn't hear anything I just said", that would have been true—for "you" would seem to still be referring to the person to be fired, not to my wife. Maybe, though, the "you" would have shifted in reference by this point? I think the story about attributive use of definite descriptions transfers to attributive use of indexicals. Suppose I am watching a soccer game on the tube. I falsely believe the game is being broadcast live, but there is in fact a ten minute delay. Suddenly upon seeing a pass I exclaim: "Now is the best moment in a soccer game that I have ever seen!" The "Now" does not, I think, refer to the time at which I am watching, but to the time at which the pass actually happened. Nothing surprising about attributive use of indexicals, because after all an indexical is essentially a degenerate case of a definition description. "The next shortest man after me" is a definite description even though it uses "me" and likewise "The entity identical with me" is a definite description. And we can just say "I", which is briefer. Compare the metalworker and the swordsmith. The metalworker's profession is defined by a particular technique for achieving human ends: the production and modification of items made of metal. The swordsmith's profession, on the other hand, is not defined by any particular technique. It is, instead, defined by an end: the existence of a sword. The two sets of skills may overlap: both a swordsmith and an metalworker can make a sword of metal, and in so doing remain within their professional competency. But a swordsmith can remain within her professional discipline in producing a sword of horn, wood and flint (say, in an emergency when metals are unavailable), while the metalworker who made such a sword would not be working within her profession. On the other hand, the metalworker remains within her professional competency when she makes a metal spoon, while the swordsmith is not working as a swordsmith when she makes a spoon—even though she may be as qualified to produce a spoon as any metalworker, and more so than some. We can in general distinguish means-defined professions and end-defined ones. Examples of means-defined ones: software engineer, electrical engineer, chemical engineer, metalworker, woodworker, machinist, applied mathematician, lawyer. Examples of end-defined ones: civil engineer, aviation engineer, swordsmith, bowyer, cabinet maker, physicist, pure mathematician, biologist, legislator. There will also be cases of professions defined both by and end means. Some of these result from specializations within a means-defined or an end-defined profession—and sometimes it will be unclear which way is the better way to look at it. Is a biomathematician an applied mathematician (means-defined) who uses mathematical methods for the sake of gaining biological knowledge, or is a biomathematician a biologist (end-defined) who uses mathematical methods to pursue the end distinctive of her biological profession (namely, biological knowledge)? It may be that in all cases of end-defined professions there are some constraints on which means count as part of the distinctive activity of the profession. Thus, it may be argued not be a part of the civil engineer's profession to pray that the bridge not collapse, even though doing so promotes the end that defines her profession. However, it is not clear that this is so. It may be a prejudice to say that the civil engineer does not pray qua engineer. Nonetheless, despite borderline cases, a basic division into professions primarily defined by a means or set of means, and those defined by an end or set of ends, seems helpful. Does any of this matter? I think it can. For instance, consider this question: Is it the job of the physician, qua physician, to execute criminals? Assume that the case is one of the rare cases where capital punishment is morally permissible. As has been noted at least since the time of Plato, the physician's professional knowledge makes her the most effective person at both preserving life and taking away life. Moreover, her skills may particularly enable the taking away of life to be reliably painless. If the physicians's profession is primarily defined by means or techniques, then to execute painlessly falls under her profession just as much as to heal. If, on the other hand, her profession is defined in terms of ends, presumably the relevant end is something like the good functioning of the body, and this goal is not promoted by killing. And euthanasia is also not something that falls to the role of a physician. I think our concept of a physician is a mix. When we talk of the crime of practicing medicine without a license, we are thinking of medicine as in part defined by a particular set of techniques. One does not count as practicing medicine without a license if one suggests to someone that she refrain from eating too many cheeseburgers or if one prays for her health. But only in part. If someone who is not a medical professional intentionally stabs someone else to death with a surgical knife, she would not, I suspect, be charged with practicing medicine without a license in addition to murder, no matter if she had pored anatomy books to figure out how to do the deed. Moreover, most of the subdivisions within medicine, with the most obvious exception being surgeon, are end-based: the neurologist, the psychiatrist, the gastroenterologist and the pediatrician are each defined by which instances of the goal of health it is their special task to promote. The pharmacist, on the other hand, is equally defined by means and by end. She does not act within her role if she prepares medication for an execution. It is, after all, her job to take solicitude for the health of the patient, ensure that she is not allergic to the drugs, etc. But she also does not act within her role if she performs surgery. There is more, but that would make this post into a spoiler. Actually, I think Elizabeth (the female speaker) underestimates the power of volitional belief. (Premise) There is not sufficient scientific evidence or professional experience about the sequelae of euthanasia for the patient. Therefore, it is not professional for a physician to euthanize a patient. In support of premise (2), note that a crucial thing to have scientific or professional evidence about in the case of a medical procedure is what kinds of things, if any, the patient will be conscious of after the procedure. Now, there is good reason—and perhaps we can consider it "scientific reason"—to think that after the patient is killed, it will no longer be the case that the patient will be conscious of the particular pain, discomfort or indignity that prompted the request for euthanasia. However, there is no scientific evidence or professional experience about whether the patient would or would not have other pains, discomforts or indignities. In fact, there is no scientific evidence or professional experience about whether the patient would or would not have any conscious experiences whatsoever after the procedure. There are no conscious patient experiences following the procedure. The patient is conscious after the procedure, and her conscious states are extremely unpleasant. The patient is conscious after the procedure, and her conscious states are extremely pleasant. The patient is conscious after the procedure, and her conscious states are neither extremely pleasant nor extremely unpleasant. Surely, the physician who performs the neurosurgical procedure in a responsible way has to have grounds for thinking that (5) isn't the likely outcome for this particular patient. Moreover, for the procedure to be done professionally, those grounds have to be of the sort recognized by the profession—namely, they have to be scientific or based in professional experience. Observe that the patient's belief as to what the outcome of the procedure would be will not suffice to render a procedure professional. Suppose there is no scientific evidence or medical experience as to whether morphine fights colon cancer. If I request morphine from the physician because I believe, on non-scientific and non-medical grounds, that it fights colon cancer, the physician would not be acting professionally in granting my request. This is true even if my non-scientific and non-medical belief is justified, or even if it is knowledge, say because I know that an angel told me that morphine alleviates colon cancer. It is the physician's professional expectations as to the major sequelae of the procedure that are relevant to whether the physician should perform a procedure or prescribe medication, not the patient's beliefs. Professional medical practice, as it is generally understood in our society, requires both the actual or presumed or proxy informed consent of the patient and the physician's professional judgment. Whether a procedure is or is not professional. Whether a procedure is or is not unprofessional. Whether a procedure is or is not morally permissible.